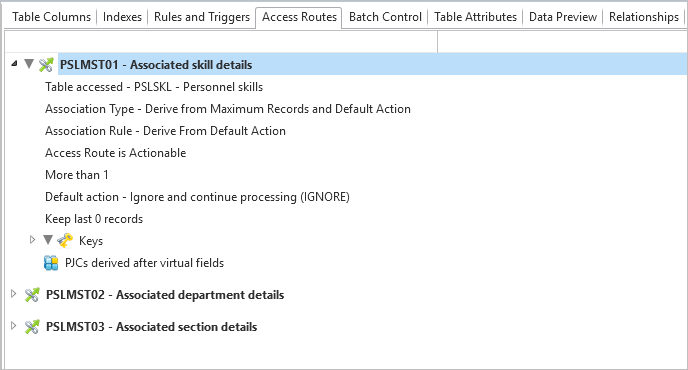 Select the Access Route tab to work with the Access Routes for the table. Use the Add Access route option. An undefined access route is added to the table. Double-click the new access route to display the Details tab and to define the access route. To specify the key for the access route, select the new key column and fill in the details in the Details tab. Use the Add Key option. Specify the details of the key column in the Details tab. Select the access route and use the Add PJC option. Specify the details of the PJC it in the Details tab. Use the Move Key Up and Move Key Down commands. Right-click to open the definition of the selected column.